“You’re just being paranoid, just plain old paranoid.” Joyce Watson gripped the steering wheel, her knuckles whitening. For the thousandth time, she glanced into her rearview mirror. Her heart pounded painfully against her chest. The red sports car was still behind her. It had been since she crossed the Virginia line. Possibly since she left Bangor, Maine. Or was she mistaken? Was it really the same car she’d seen Jerry Garrison driving while following her in Maine? She was almost positive she’d lost Mike’s so-called friend way before entering New Hampshire. Could it be her former boss? No. It couldn’t be Mike Vernet. It just couldn’t. She took her attention off of the mirror and the car. A brightly painted sign on the side of the mountain road welcomed her to Cascade Valley, Tennessee. She glanced back in her mirror, hoping the car was gone. No such luck—it was even closer. Her heart rate accelerated. Was she truly being followed? Had Jerry somehow caught up with her? Had Mike sent another one of his thugs to keep tabs on her in his absence—or to finish her off? She shuddered at the thought. She spotted a police station about a mile into town. She swung into the parking space closest to the door, in between two police cruisers. Whipping around in her seat, she watched. The car continued down the road. Her shoulders slumped, and she breathed a sigh of relief. The make and model were different from the one Jerry had been driving. Jerry drove a Charger; the one that passed her was a Challenger. She leaned her head against the steering wheel and waited for her heart rate to slow. Calm down, Joyce. There’s no way Mike, Jerry, or any of his so-called friends followed her. Besides, if someone had followed her, it wouldn’t have been Mike. He would’ve hired somebody else to do his dirty work. Mike’s business trip had clinched her decision to run. She hoped his weeklong absence would give her the edge she needed to escape. But with all he had at stake—with what she had against him—it was only a matter of time before he put a price on her head. If there wasn’t already one there—and she was pretty sure there was. What if she hadn’t escaped the first attempt on her life? Her eyes misted at the thought. 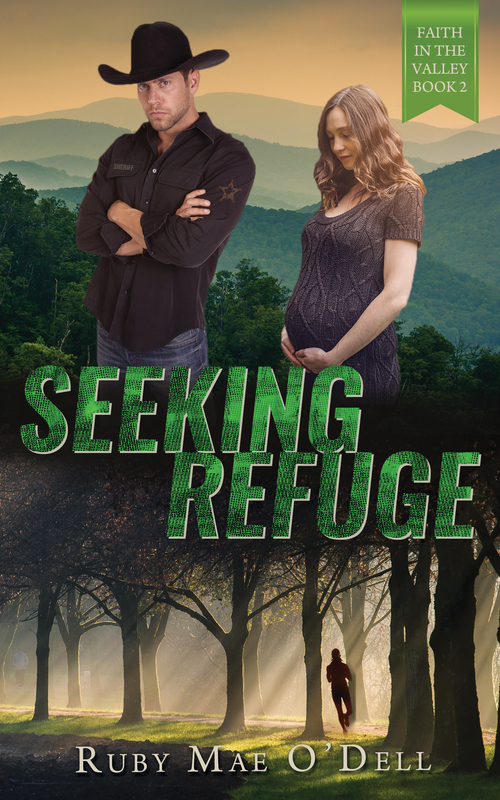 She owed her life to God, and she trusted Him to help her find a place to hunker down and disappear. If she didn’t find a place soon, Mike would silence her for sure. Joyce jolted straight up in her seat. She jerked away from the window, a scream lodging in her throat. Her heart raced so fast she could hardly breathe. A tall man in uniform was stooped down, staring at her. His eyes were wide with surprise. With his hands in the air, he took a step back. Her stomach dropped. Several of Mike’s thugs were police officers. Was this one of his men? She inhaled deeply, effectively calming herself. Anyone she’d known in Maine would have a hard time recognizing her now. She forced a smile and pressed the button to lower the window—or at least tried to. Her hands shook with such violence, it took several attempts to get the window down. The officer returned to the window, rubbing the back of his deeply tanned neck. “Sorry, Ma’am. I didn’t mean to scare ya. Are you okay? Can I help ya with something?” His bass voice drowned out the remnant of her pulse, which roared in her ears. “Seriously?” She could hear the dismay and exhaustion in her voice. “Yes, Ma’am. We do have a B&B on the edge of town, though. But the best accommodations are the cabins at our Cascade Valley Guest Ranch. It’s a favorite with most tourists who travel through these parts. Tourist season is out right now so it’ll be nice and quiet for ya, and it’s far better than any motel—I personally guarantee it. And if ya tell them I sent ya, they’ll give ya a good rate,” he said with a smile. She didn’t really have much of a choice. She had to stay somewhere. Physically and emotionally spent, she needed a good night’s sleep. A small, valley town, hidden in the mountains of East Tennessee, sounded like the safest option right now. “Okay then. Thank you, Officer…?” She inclined her head in an effort to see the name on his badge. “Okay, then.” She tried for a friendly smile, but something told her that she was less than successful with the attempt. The sheriff smiled in return before climbing into his cruiser and pulling out. Placing her car in reverse, she backed out into the street and drove up behind him. She stayed close behind his cruiser, glancing in the rearview mirror for the red sports car now and then. Well, she ain’t Joy Walker, that’s for sure. She’s hiding something—but what? Isaac glanced in his mirror. Her car was right behind his own. Hopefully, she wasn’t running from the law. But the guilt written all over her face…he’d have to do a little digging to find out. His red flags had gone up when she’d told him her name and her face had colored with guilt. Horrible liar. Maybe she was just hiding from an ex-boyfriend or the like. Isaac sure hoped the lovely stranger would stick around town long enough for him to find out why she was hiding. He shelved that thought for later. His family’s guest ranch came into view. Driving down the long gravel drive to the Family Cabin, he glanced once again into his rearview mirror. She was still right behind him. He parked his cruiser and got out, smiling when Joy did the same. “So, whatcha think?” He extended his arms in a sweeping motion. The Family Cabin stood in the center of the opening while his cabin, along with his siblings’ cabins and twenty for guests, surrounded it on three sides. Beyond the cabins stood a large, rustic barn where they housed the horses. Beyond the barn were the pastures, fifteen trails, and the distant mountain range. “I’m sure I can manage from here. I don’t want to put you out. You’ve been most helpful, and I greatly appreciate it.” Her voice was laced with gratitude, but there was a tinge of something else—obviation. 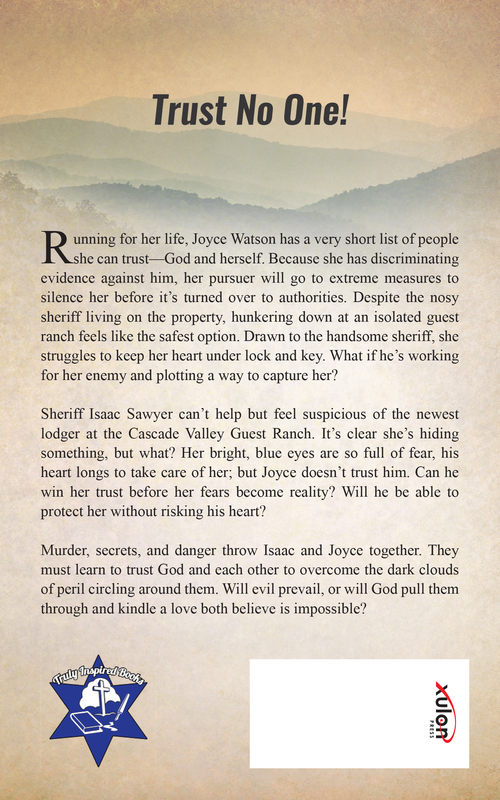 Joy flicked a quick glance his way before she answered, “I’m Joy Walker. It’s a pleasure to meet you, Mrs. Sawyer. This is a beautiful place you have here.” He couldn’t help but notice that guilty look in Joy’s eyes when she repeated the same lie she’d told him. “Well, for land’s sake! Why didn’t ya say so? Come with me, dear. I’ll show you to the finest one bedroom cabin on our ranch.” Momma paused before she made it out the door with Joy and addressed him, “Isaac, you can bring Joy’s luggage to the Hummingbird Cabin.” She was out the door before he could respond. He shook his head, smiling. The guests always felt welcomed and loved by Momma. She had a way with everyone, it seemed. He walked out and grabbed Joy’s bags from the backseat of her car. He carried them to the Hummingbird Cabin and set them on the porch swing, freeing his hands. He raised his hand to knock just as Joy opened the door, a beautiful smile on her face. Momma stepped out from behind Joy onto the porch and said to her, “Now if you need anything at all, don’t be afraid to ask. I hope you’ll enjoy your stay with us.” She hugged Joy before turning and heading back to the Family Cabin to fix supper, leaving him alone with Joy. He took a moment to fully look her over. She ran a hand through her golden-blonde hair, which flowed well past the small of her back and seemed to shimmer in the rays of the setting sun. She shifted her weight and stared up at him. He figured she couldn’t weigh more than a hundred and twenty pounds with her petite body frame. She only stood about five and a half feet tall, which made him feel taller than he already was. But it was her eyes that grabbed his attention, those beautiful blue eyes that sparkled with amazement. A small smile graced her lips as a soft blush tinged her cheeks. “Thank you, Sheriff, for everything.” Her voice was filled with a sincere gratitude that warmed his heart. Joyce waited until Isaac walked out and shut the door before collapsing on the leather sofa in the living room, relaxing against the floral print pillows. She hated lying. She knew God did as well, and she’d lied twice today. She prayed God understood why she’d done so and forgave her. She didn’t know whom she could trust. She didn’t know who was on Mike’s payroll, and she couldn’t afford to trust just anyone, not even with her name. What was she going to do? Even if Mike hadn’t noticed what information she had yet, he would before long. Though she was sure he already knew. What other reason could there have been for Jerry’s appearance at her apartment complex the same day she was skipping town? And if he already knew, what then? She needed to find someone she could completely trust to pass along the information she had. Isaac Sawyer’s face flashed through her mind briefly before she pushed it away. No way. Isaac Sawyer was a cop, a sheriff no less. Mike had so many law enforcers on his payroll, it made her head spin. If there was one group of people she should be wary of, it was law enforcement. Trusting Isaac was not an option. She sat up and glanced at her watch. Fifteen after seven. Maybe she had enough time to get a power nap in before dinner. She was exhausted. She made her way to the bedroom, put her bags on the floor next to her bed and her backpack on the dresser before collapsing on the bed. Just a short nap before dinner. Thirty minutes tops. That was her final thought before embracing the welcoming beckoning of sleep. Joyce thought, when the pounding on the front door shook her from her sleep. She bolted to the dresser and retrieved her pistol from her backpack, checking the chamber to assure herself it was fully loaded before walking stealthily to the front door. “That would be great, thanks.” She held the door open for him. He carried the tray into the kitchen and placed it on the table. He strode back into the living room, coming to a sudden stop as his eyes landed on the coffee table. Her eyes latched on to what had caught his attention. Her heart hammered in her chest. In her rush, she hadn’t fully covered her pistol. The barrel of it protruded slightly from beneath the newspaper, making its presence known.